Organic Monitor Larry Rosalez sorts through organic material picked up by the City of San Antonio Solid Waste Department at the New Earth Soils and Compost facility at 7800 East IH-10, Tuesday, August 18, 2015. Amid 12-foot-high mounds of compost-in-the-making, Larry Roy Rosalez pulls on thick leather gloves as he prepares to wade into smaller, compacted piles of stuff unloaded from organic recycling carts in a large open field on the Northeast Side. One of the workers at New Earth Compost, which handles the city’s organics recycling program, Rosalez walks along the long lines of piles, pulling out what doesn’t belong: bags of trash, dead animals, a giant pair of plastic “Hulk” fists, discarded Halloween masks, other holiday decorations and more. In case you’re wondering, no, it doesn’t stink; and thanks to a fine mist that continually sprays odor-eating microbes throughout the property, what’s left is an earthy scent of freshly plowed soil. When he’s through sorting for the day, Rosalez climbs into an earthmover to push the piles into a new mound that will become compost. For more than three years, he’s worked through blistering heat and chilly winds as the city’s lone organic monitor. But according to the city’s 2016 proposed budget, Rosalez won’t be alone much longer. The budget includes funding for an additional 20 sorters, along with sorting and pre-processing equipment and a covered open shed, making it similar to the local recycling plant. The additional workers will be needed because all city residents are in line to receive green, wheeled bins for organics.The program will be rolled out over 18 months and will be available to 190,000 customers in fiscal year 2016. The remainder of residents will take part in fiscal year 2017. In total, the city provides solid waste disposal services to 346,000 single-family homes. New Earth President Clayton Leonard said the company has invested close to $2 million in preparation for the expansion. He said last year that the company collected more than 7,000 tons of material; in the future, it’s expecting 50,000 tons per year. San Antonio’s robust organics recycling program is one of the best in the state, even if Leonard says so himself. Leonard said that after the green bins’ contents arrive at the 116-acre property, the trucks are weighed and the contents are dumped at the sorting area. Ninety days later, after a particle reduction process, the material comes out as compost. The compost is sold at local H-E-B stores and in bulk wholesale at a retail section at New Earth. On a recent tour of the facility, Leonard noted that each compost pile is marked with the date it was started. The temperature in the piles can rise to 170 degrees — hot enough, Leonard said, to roast a turkey. Leonard said that once a month, a drone flies over the facility to measure the volume of the mounds. Before drones, workers walked the yard, measuring every pile for information. Such technical innovations are reducing manual tasks by workers. But until automated help arrives, Rosalez will continue to scoop up material, feather it out and separate the contents by hand. A pilot program for recycling organic material began in 2011, when the city partnered with New Earth to get it started. 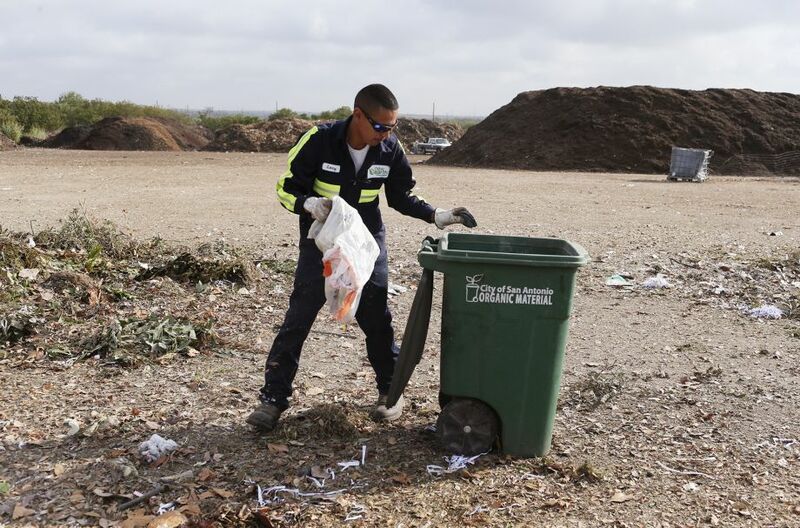 Tiffany Edmonds, a spokeswoman for the city’s solid waste management department, said 20,000 residents now subscribe to the organics collection service for $3 a month, which includes the green cart for a weekly curbside pickup of organic waste. In October, that charge will go away. All residents will be getting the green carts at no additional cost; they also will choose the size of the brown trash cart they use, with a change in price: small, 48 gallons, $20.43 per month; medium, 64 gallons, $20.93; and large, 96 gallons, $22.18. Currently, residents pay $20.93 per month for the 96-gallon cart. Food scraps and other organic material shouldn’t be bagged in plastic before throwing them in the green cart. Edmonds suggests wrapping food scraps in newspaper or putting them in food-stained paper bags or pizza boxes to help prevent odors and to help keep the cart from getting a stinky residue.